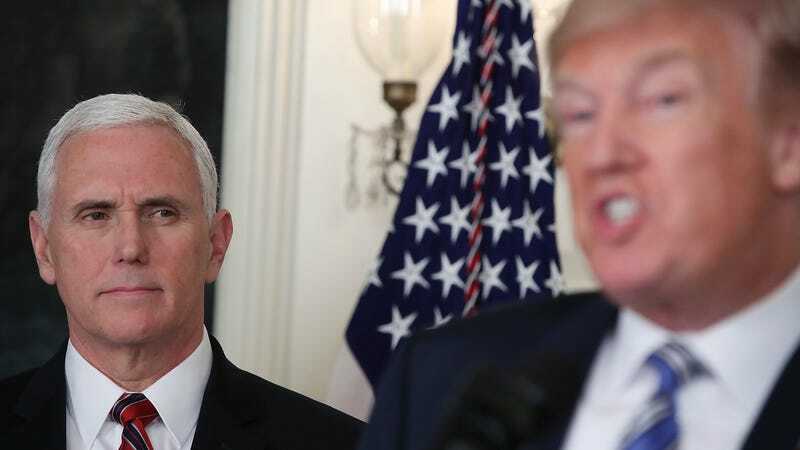 Been a while since we heard about Mike Pence, yeah? Where do you think he’s sitting right now? What mischief is he getting up to? Maybe he’s standing in a closet full of dark wool suits, combing his soft, silver hair with a curry brush—the kind used for short-coated dogs and stallions—quietly humming a sweet, indiscernible tune to himself. Maybe after he brushes his hair 100 strokes to the right and then another 100 strokes to the left, he lets a quiet prayer leave his lips. Maybe he contemplatively irons. If he gets it wrong, mother fixes it. Mother always fixes. There are so many ways to fill the day when all you have is time. Maybe he has taken up textile arts, spinning yarn from the fur shed off the soft body of Marlon Bundo. Maybe he sits in an antechamber in the bowels of the White House, lulled to a stupor by the spinning wheel’s gentle thrum. Maybe he contemplates time, how it passes, how it sometimes seems to stand still. The days can feel slow but the future is there, waiting. It calls to him and he hears it.